Oh My Barks, It Snowed! Just like the tite says! it snowed last week. Yes, yes.. this video is supet late but mommy said the computer box was not letting her share this video with everyone. So now the computer decided to let me put it up! 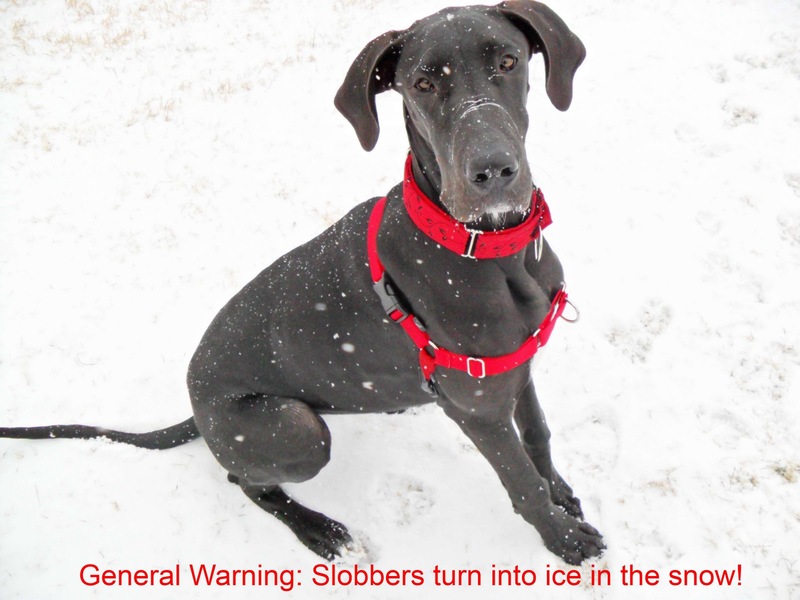 So check out the fun things you can do in the snow! ﻿ So this picture is all the way back from Septebmer but it was cute and im not sure if I shared this with my bloggie doggie friends! So anyways, on to the topic! I took mommy over to PetsMart today because we were doing another SantaPaws event (remember that post from last week with santa and me running out into the parking lot) Yes, well I wanted to give it another shot. No, I didnt gonear santa but I got to walk around the store with Mommy showing off all my cuteness! 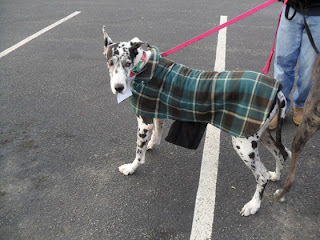 Mommy got to talk to people about Great Danes and how awesome it is to rescue a doggie like me! Yes, I know your saying.... "Nova your not even a rescue pup"... Mommy understands that but she says that she loves me so she would never want to change the fact that she got me from a breeder but that she didnt know about rescues and things before she got me. 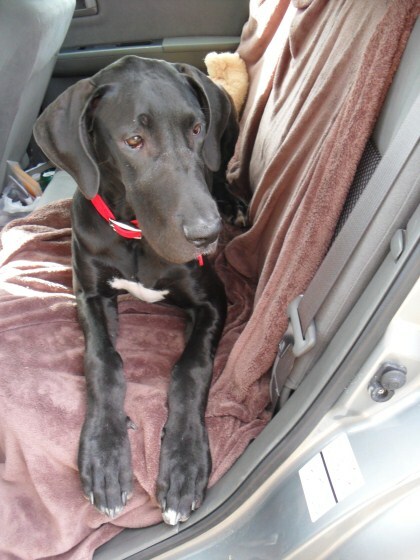 Mommy says that my next brother or sister will be a rescue Dane but that is a LONG time from now..
Anyways, the exciting part is that I was so well behaved last weekend and this weekened at the MAGDRL evens that they invited me to be a Great Dane ambassador for the Rescue! The really nice lady said that I was so well behaved that I was a good pup to show off how awesome Great Danes can be! So that was so fun and exciting because mommy always tells people how awesome I am but hasnt been able to tell you about people telling her how well behaved I am.. So we are so excited to be a part of a group where Nova can go out and strut her stuff!! Snowy Pictures... A TOTAL MUST SEE! So mommy took me out side today because it was snowing super hard out and I got to play for 2.5 hours!! Can you believe it!? She snapped some great pictures of me (although all pictures of me are beautiful.. RIGHT?!) I even took some pictures with my Santa hat! Oh a NEW and suprising thing that has never happened... My slobber thatI shake and it lands on the top of my nose.. well that stuff gets super cold and freezes into ice in just like 5 seconds!! But I didnt seem to mind! A close up of my slobbers! I was totally trying to play in the snow by now so I was a little distracted but mommy just loves all the pictures of me in the snow! My mommy LOVES this picture because she says its a great picture of what a Dane actually looks like! She was so happy when I she snapped tis picture! I even listed to mommy and laid down in the snow!! Mommy thinks im getting really good at my basic commands.. I mean look, I can perform them in the snow. Do that make me a pro yet? OMB's im so funny! Do you see my big ol lip waving in the wind?! Well Everyone.. Merry Early Chrismast! Okay, so I THOUGHT Honey The Dane talked mom into just photo shopping some hats on my head but Mommy has just gone to far!! How come nothing comes in my size? Scary Santas, Snowy Days, Presents, and a Play Date! Okay so the last couple days have been very eventful! 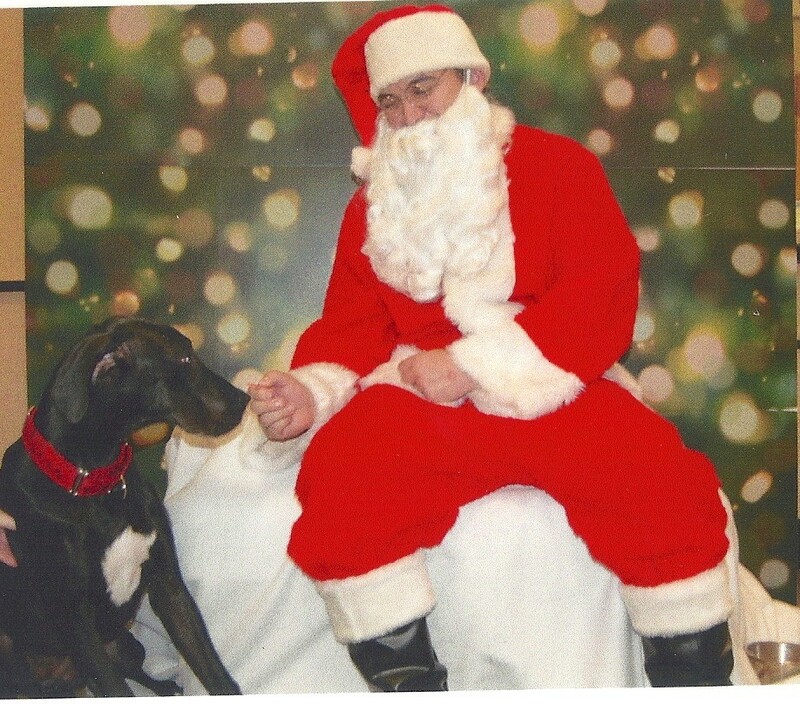 This past sunday I went to a picture with santa event that supported the Mid-Atlantic Great Dane Rescue, Sothern VA Chapter. We had so much fun but I got in big trouble. It was totally not my fault and mommy should have known! I HATED santa! I jetted out of the PetsMart door into the parking lot... I was soooo sared because a BUNCH of people were running after me.. but ONLY mommy knows how to get me back.. and you know how mommy knows? OF COURSE, Honey's human taught me.. If mommy wants to get me back then all she has to do is run away from me and make funny noises.. So that is EXACTLY what she did (thank god we had tons of practice in the bark park before that day..) It was super scary and im sooo glad there is no more Santa! Here is my HORRIBLE picture.. its the BEST one. Okay so now that that embarrising moment is over on to more fun things!!! I got to se a whole bunch of snow well no not a lot, but it ws my first snow so I thought it was a whole bunchies! So how did you like that?! didnt it look like I had fun? I know I know it was only couple seconds but I did some good zoomies off camera! Here ae a couple pictures! I know it looks like I hated the snow.. but really I just hated standing still and not playing!!! URR dang ol mommy trying to take pictures! I got a Package from my gift exchange! OmB it was super excited!! My FIRST EVER package in the mail! So thank you to my wonderful Doggie Bloggie friend who sent this to me!!! I had sooo muh fun that I even put a couple holes in the card :(... Mommy was not tooo happy about that but it was MINE right!? Okay so LASTLY, I had an awesome Doggie Play Date with my new friend Apollo the Chocolate Lab... I know mommy is not that great with action shots but she was getting to know Apollo's mommy more. See Apollo's Mommy is also a "Navy Wife" and his daddy works on the same big shippie thing that my daddy works on. Being a (somewhat) reliable pup! So this is just a couple seconds of the video because I didnt want to bore all 5 of my viewers! Check out Honey and her Human's video on Reliability: Honey & Her Human! Anyways,this is a picture of me licking my lips right after my first bowl of Taste of the Wild.. Yes, my mommy finally picked out the right food for me after spending months and months of research time and time on the DOL forums. Taste of the Wild is the most crunchiest food I have ever had so its super messy.. mommy might even start feeding me outside! So this is me with my FIRST Martingale style collar. 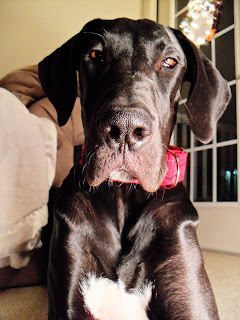 Mommy gave me this for my 6 month birthday and she got it from a wonderful sweet lady that makes them and has a Dane of her very own. 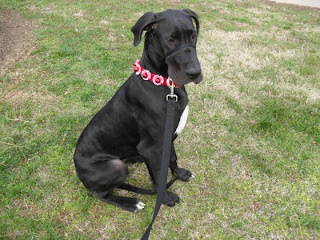 Mommy is super picky about collars so Ximmy's mommy sent my mommy a message and told her to check out her collars.. so mommy did and she fell in love with this red and black one. Mommy just wanted to show you pups this lovely picture that she took of me yesterday. I was NOT into taking pictures last night but mommy insisted on taking pictures of me! Mommy was working with the lights that we had in the house to try and get a great pictre of me... but im thinking ay picture of me is great! What do you think? I think I look super Cute! OH and lastly, Be looking out for 2 videos that mommy will be putting up. I learned a new trick and mommy wants to introuce herself!! so they will be up super soon! BUT... On December 5th, 2010 I was i my first Christmas parade and and and... it was to help get the word out for the Mid Atlantic Great Dane Rescue League (MAGDRL) here in Virginia. There were a total of 8 Great Danes that came and of course... I was the SMALLEST.. There were a couple more youngster pups but ill get to them in a second! ﻿Okay so Mommy is such a worry bug and has to get to every event like 5 hours befoe it starts.. and of course she did it again.... BARK. I hate hate hated standing in the cold for 3 hours waiting for all the other danes to show up, but once they did I was completely into the whole groove of this parade. Okay so on to the Danes.. Because I KNOW you want to see who I got to meet! Harmony was super skiddish but look at her sporting that hat like a pro! Everyone thought she was super adorable, could you possibly be human if they didnt? Oh Oh Oh this is when we get to talk about me again! So you see the collor mommy made me wear? This parade was a last minute thing so we just got the cutest one they had at pets mart.. But mommy will know for next year I need to be prepared with cuter looking collars for Christmas! This is Leah. 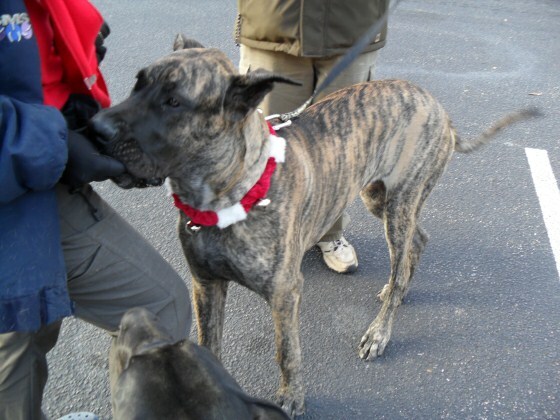 Leah is a 3 year old Harliquin female who was rescued by her wonderful new parents. She was hit by a car and had surgery. She has also had puppies so she had to get fixed right after he leg was operated on. 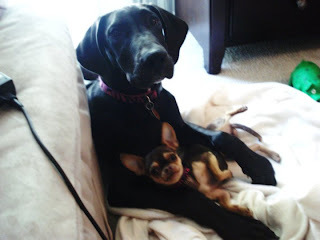 She has been through a whole lot and now enjoying her forever home with her brother dane Loki. This is Loki, Leahs Sister. 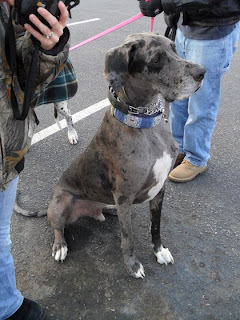 Loki is a very large (compared to me) mis marked Merle Dane. He is supppperrrrr sweet. leah and Loki are the two danes that live in the next building over from me where we live. Thir mommy works for a pet resort so they get to play a lot and do lots of fun events. Loki is one of those normal dogs that is not good with leash greetings and great off leash playing in the park. His parents are super smart about doggie personalities and knows that this is a common and okay thing. 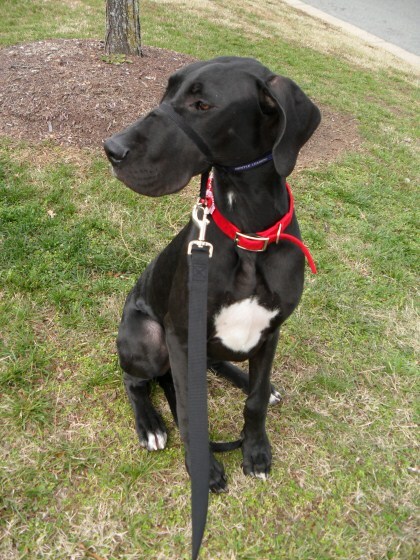 (Read Honeys Blog to get the full understanding of the on leash greetings). I absolutly love talking to Leah and Loki's parents becasue we have a lot of the same views. Okay Okay.. So I am not the Great Dane with the highest IQ on the planet but Soap Boggers are soooooo Yummy! So this is what happens when I get involved with my mommy's bath time.. Supposidly bath times are for relaxing but ... I, Myself, have never had a relaxing bath, So I dont know what mom is talking about!!! Can you see my soap boggies on my nose? So this is what I always look like when I get into these awesome soap boggies! You can control the sent of Lavendar and vanilla?!?! I know I cant! Yummy! Dancing, Parades, and Danes on my! So mommy (and I ) have been busy lately! We are finally working on the Doggy Freestyle Started that Honey and her human showed us. If you havent seen it go down a couple blogs and you will see the video from Honey and her Human for the small freestyle dance! 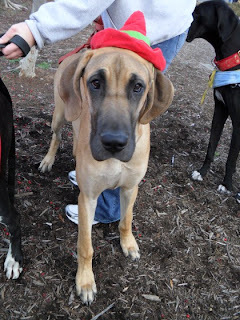 Mommy took me to petsmart yesterday so I could suit up for the Christmas Parade on Sunday (Dec 5th). You will get to see it super soon. MOmmy is a little worried that everyone will call me a "he" because I wont be wearing pink... but I still get called a "he" everytime even when I am wearing pink.. dumb humans, im such a pretty GIRL! 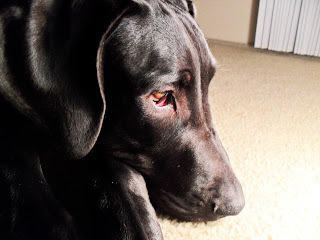 Oh so in this picture I look super tiny.. Mommy just doesnt know how to show off my good sides! But she weighed me today and im 74 pounds!! Wow. I am still pretty lanky but will gain weight as I grow I guess! I also got to play with the two full sixe danes that live across the circle from me! They heard we were going to the parade and they are actually going ot be in it too, so they came out to play! Their names are Loki and Leah. Loki is a dark Mis marked Merle (he looks like a darke blue male from far away but when you get close you can see the dark spots) and Leah is a rescue Harli. Loki is super huge (but his mommy says that Loki is not even big compared so some danes we will see at the parade!!) So yes they were super fun to play with! 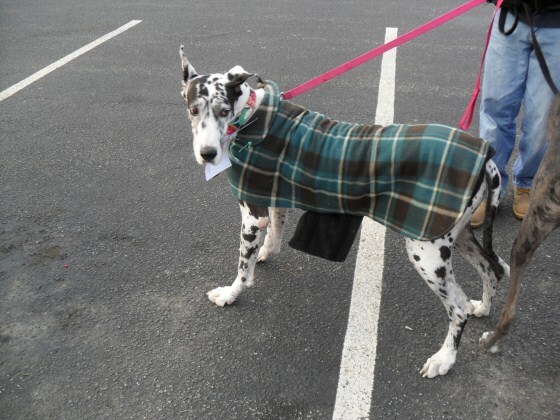 Lastly, Mommy started a Virginia beach Great Dane Meet up Group. We will be doing our first meet up in early january so if you are near Va Beach or know someone please let them know! I would love to play with a bunch of great danes!!! Here is the link: http://www.meetup.com/VABeachDaneLovers/ . We currently have 4 members including me. We have three coming to our first meet up because the fourth doesnt live in VA Beach yet!!! Alright thanks so much for catching up with me again!! !